We have some perfect Christmas gift ideas for Scuba divers and we ship worldwide! And other dive log accessories to complete your binder. Personal info, equipment records, servicing, notes etc. We have some special hard to find items! Our unique designer service: Custom Scuba Slates covering three very special products: Scuba diving slates, waterproof reference cards (fish slates), and our patent pending quick change wet notes system! This covers so many new exciting possibilities from a special slate just for you, to discounted bulk quantities for clubs and dive operations. Plus this is not just for Scuba Divers! Medical First Responders, researchers, swimming instructors, and field workers are already using our waterproof writing solutions, and now they can be customised as never before. Take fish id information with you in your dive log binder with our Fish ID Log Pages. Or, take them underwater on your next dive with our fully waterproof versions! Over 600 of the most common species in global and regional collections with space for your notes and sightings. Taking fish information with you has never been so easy! We post regular updates to our products, new dive log features, or services on our facebook page. We offer Rite in the Rain paper as an optional upgrade to make your dive logs water resistant. We also have fully waterproof dive logs, fish id cards, scubatags, and dive slates for underwater use. From your first breath underwater, we want to help you remember your dives in the best dive log possible. We think nothing beats turning old pages and reliving memories from your diving holidays. And we have built the best paper based dive log system to help you do that. But if you have moved on to the online world (or are just starting out), then please take a look at our free dive log map service. Just the start of our eventual free and full featured online dive log. Why are we the best dive log system? We believe that to produce exceptional quality, you have to own and deliver as much of the design, production, and order fulfillment as possible! One of DiveLogs founding principles was to do customer service differently. It is our belief that if we get this right, you will trust us now, and in the future. Get what you want and need, do not live with second best. We give you choice and lots of it. You then decide how far to take our flexibility. 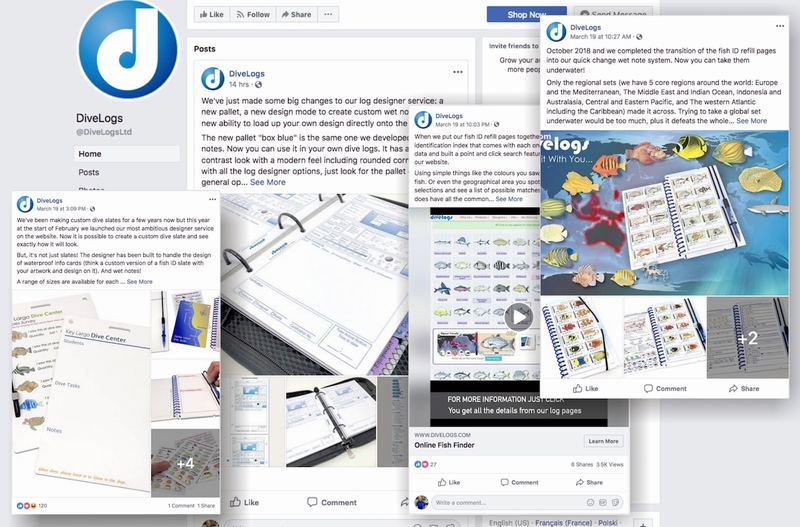 We constantly try to improve your dive log by designing new products that just don’t exist anywhere else, such as our log designer service and wet notes. We design every part of our dive log system and make most of it in house on the latest print technology. The quality of service you provided was fantastic!!. I cannot believe that I placed the order on Saturday and you delivered on Wednesday!!! As I am the Secretary of our dive club I am sure you will be getting a few more order once I have had a chance to show off the Stamp and the Log Books. Just to say the service you provide is excellent. The stamp came in no time at all and is perfect. It was also nice to deal with a company that doesn't have loads of hidden costs, especially for sending abroad. I will make sure that I recommend your site to friends. Thank you so much for the re-made stamp and the once again extremely prompt response. My husband is thrilled to bits! We will be showing off our stamps to all and sundry at our local dive club and also abroad on holiday so hopefully some more business will come your way. Thanks again for excellent products and efficient service - I'm sure your business will go far with such a good attitude.